The medieval Vikings were not just the fierce raiders of stereotype, though they did descend on coastal Britain and elsewhere with terrifying raids from longships that could sail a considerable distance upriver. They were also traders who traveled the world, including eastward where they were known as the "Rus" and gave Russia its name. In Constantinople, Viking warriors served as personal guards to the Byzantine emperor, where were known as the Varangian Guard. During the climate crises of the Middle Ages, they fared westward to Iceland, Greenland and even North America, searching for good farmland. Not all medieval Scandinavians raided; most stayed home and pursued lives as farmers, craftsmen and merchants as in the rest of Europe, but in a colder climate that presented special challenges. Beginning in the eighth century, Christian missionaries traveled to Scandinavia, and by the thirteenth century, most Scandinavians had adopted Christianity. A good case can be made that the sagas written by medieval Scandinavians amount to early historical novels, so several are included in the listings. Al Bas, Harald and the Holy Cross (2008), a thriller about the Norwegian Prince Harald Hardrada during his period of exile in Constantinople; self-published. George Mackay Brown, Vinland (2005), about a young Viking who voyages from Orkney to Norway, Iceland and Ireland during the shift from paganism to Christianity. Theodore Brun, A Sacred Storm (2018), about an eighth-century Viking warrior who has pledged loyalty to the Swedish king on the eve of a war between Sweden and Denmark, although the Danish king's daughter has fallen in love with him; #1 in the forthcoming Wanderer Chronicles. Michael Crichton, Eaters of the Dead (1976), historical fantasy about a tenth-century Arab explorer in Viking Russia and Britain, based on the historical manuscript of Ibn Fadlan and the epic poem Beowulf. Michael Ennis, Byzantium (1990), about the eleventh-century Norse prince Harald Sigurdarsson (later to become Harald Hardrada, King of Norway) during the time he served in the Byzantine Emperor's Varangian Guard. W. Michael Gear and Kathleen O’Neal Gear, People of the Songtrail (2015), about a Viking settlement in America. David Gibbins, Crusader Gold (2006), a novel which imagines that Vikings sacked the Jewish Temple in Jerusalem and tells the story of a modern archaeologist who discovers a map that could lead to the discovery of the Temple treasure. H. Rider Haggard, The Saga of Eric Brighteyes (1891), an adventure story about a Viking and his efforts to win the woman he loves in the face of obstacles ranging from her reluctant parents, a rival suitor, and the woman's half-sister, who wants him for herself. Linnea Hartsuyker, The Half-Drowned King (2017), about a Viking who barely escapes being murdered when his stepfather betrays him, and his sister, whose opportunity to escape their stepfather is by marrying her brother's rival; #1 in a trilogy. Linnea Hartsuyker, The Sea Queen (2018), about a Viking leader who fights for King Harald of Norway, and his sister, the wife of a rebellious explorer; #2 in a trilogy. R. Scot Johns, The Saga of Beowulf (2008), historical fantasy based on the Old English epic "Beowulf," about a Norse hero who sets out to avenge the murder of his father; self-published. Giles Kristian, Winter's Fire (2016), about the leader of a much diminished Viking band and his struggle to avenge himself against a king who is his deadly enemy; #2 in the Rise of Sigurd series. Giles Kristian, Wings of the Storm (2016), about the leader of a Viking band who has been taken captive and is set to be sacrificed when he finds a powerful relic, a spear said to have belonged to the god Odin; #3 in the Rise of Sigurd series. Snorri Kristjansson, Swords of Good Men (2014), about a Viking on his way home with his companions who stops in a city threatened by King Olav, who is determined to impose Christianity by force; #1 in the Valhalla Saga. Snorri Kristjansson, Blood Will Follow (2015), about two Vikings whose encounter with a witch leaves them immortal, amid the struggle between Christians and pagans in medieval Norway; #2 in the Valhalla Saga. Snorri Kristjansson, Path of Gods (2016), about two Viking immortals who oppose King Olav's determination to spread Christianity in Norway; #3 in the Valhalla Saga. M.D. Lachlan, Wolfsangel (2010), historical fantasy about two brothers kidnapped as infants and raised by Vikings; based on a Norse myth. Bruce Macbain, Odin’s Child (2015), about an eleventh-century Viking who, driven away from newly Christian Iceland, travels with his crew to Lapland, Norway and Finland; #1 in the Odd Tangle-Hair Saga series. Bruce Macbain, Ice Queen (2016), about an eleventh-century Viking who serves as a skald in the land of the Rus, where he has an affair with a princess and breaks with Harald, his sworn lord; #2 in the Odd Tangle-Hair Saga series. Juliet Marillier, Wolfskin (2002), historical fantasy about a young Viking who takes part in an expedition to the Orkey Isles, where he falls in love with a princess. Juliet Marillier, Foxmask (2005), historical fantasy about a Viking whose peaceful rule in the Orkney Isles is threatened by the son of the previous king; sequel to Wolfskin. Connie Mason, Lord of Fire and Ice (2012), historical romance about a hot Viking warrior tricked into slavery and his mistress, sworn to avenge her husband's death. Tim Severin, Odinn's Child (2005), about a son of Leif Ericson and a Celtic mother who arrives in Greenland in 1001, is raised as a pagan, and fights against Brian Boru in the Battle of Clontarf; based on the Eyrbyggja Saga; #1 in the Viking trilogy. Tim Severin, Sworn Brother (2005), about an eleventh-century Viking's adventures, ranging from England to Byzantium; #2 in the Viking trilogy. Tim Severin, King's Man (2005), about a Viking who takes part in the Norman conquest of England; #3 in the Viking trilogy. Paul Watkins, Thunder God (2004), about a tenth-century pagan Norseman and his travels to Constantinople and across the Atlantic. Medieval Sweden, Norway, Denmark and Misc. Poul Anderson, Hrolf Kraki's Saga (1973), historical fantasy based on the medieval Norse saga of Hrolf Kraki. Bernard King, Starkadder (1985), based on early Danish sagas; #1 in the Starkadder trilogy. Bernard King, Vargr-Moon (1986), based on early Danish sagas; #2 in the Starkadder trilogy. Bernard King, Death-Blinder (1988), based on early Danish sagas; #3 in the Starkadder trilogy. Sarah Maine, Women of the Dunes (2018), a novel about women of the present, the Victorian era, and the Viking era in 800 A.D. on a Scottish island, linked by a present-day archaeologist's excavation which reveals the remains of a murdered Victorian woman. Eric Schumacher, God's Hammer (2004), set in the tenth century, about Hakon Haraldsson, the first Christian king of Norway. Sigrid Undset, Gunnar's Daughter (1909), a literary novel about a woman's revenge, set in Viking Norway. Sigrid Undset, The Mistress of Husaby (Norwegian edition 1921; first English translation 1925), about a woman in fourteenth century Norway, by an author who won the Nobel prize; #2 in the Kristin Lavransdatter trilogy. Sigrid Undset, The Cross (Norwegian edition 1922; first English translation 1927), about a woman in fourteenth century Norway, by an author who won the Nobel prize; #3 in the Kristin Lavransdatter trilogy. Sigrid Undset, The Axe (English translation 1928), about a man and woman in medieval Norway who were betrothed as children but must fight to be wedded after plans change and they are expected to marry other people; #1 in the Master of Hestviken quartet. Sigrid Undset, The Snake Pit (English translation 1929), about a young married couple in medieval Norway who are burdened by guilt; #2 in the Master of Hestviken quartet. Sigrid Undset, In the Wilderness (English translation 1929), about a wealthy and respected widower in medieval Norway whose guilt leads him to a life at sea; #3 in the Master of Hestviken quartet. Sigrid Undset, The Son Avenger (English translation 1930), about an elderly widower in medieval Norway who must watch his children repeat the tragic mistakes he once made himself; #4 in the Master of Hestviken quartet. 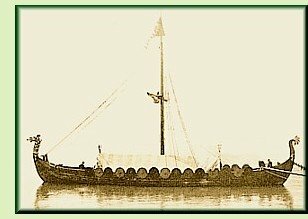 Joan Clark, Eiriksdottir: A Tale of Dreams and Luck (1994), about the Viking expedition to Vinland on the American continent from the perspective of the daughter of the expedition's leader. Bernard du Boucheron, The Voyage of the Short Serpent (2008), a darkly humorous story about a medieval bishop sent to a doomed Catholic colony on Greenland to collect tithes and punish sinners. Vilborg Davidsdottir, On the Cold Coasts (2012), about the love between an unmarried mother and an ambitious priest in fifteenth-century Iceland. Cecelia Holland, Two Ravens (1977), about a young man in twelfth-century Iceland who leaves home to get away from his violent father but feels the need to return. Tom Holt, Meadowland: A Novel of the Viking Discovery of America (2005), a humorous story of the Vinland discovery, narrated by a Scandinavian soldier in the Byzantine Varangian Guard. Jeff Janoda, Saga: A Novel of Medieval Iceland (2005), set in medieval Iceland. Tim Leach, Smile of the Wolf (2018), about two friends in tenth-century Iceland who, after killing a man, must struggle to survive as exiles from their community in a harsh landscape. Judith Lindbergh, The Thrall’s Tale (2006), a literary novel of a woman's revenge, set in medieval Greenland. Nevil Shute, An Old Captivity (1940; also titled Vinland the Good), about a pilot hired to make an aerial survey of Greenland whose dreams about life as a Viking slave include important historical details. Jane Smiley, The Greenlanders (1988), about a family in the Norse colony in Greenland during its decline. Betsy Tobin, Ice Land (2009), literary historical fantasy about Freya, the Norse goddess of love, and a human woman who falls in love with a man from an enemy clan in Iceland at the turn of the first millennium. William Vollmann, The Ice Shirt (1990), about the Viking discovery of Vinland in North America; #1 in the Seven Dreams series (see 17th Century page for others in the series).